Anyone who is involved in this hobby for any significant length of time will no doubt have either encountered the perception that the only stamps worthy of serious study or collection are those issued before World War II, or they hold that belief themselves. However, it is my belief that while classic stamps are undoubtedly very appealing and beautiful, collectors who eschew modern material are limiting themselves quite significantly. Of course, if as a collector you simply do not like modern stamps, then there is no reason to collect them. However, I think that it always makes sense to periodically examine one's beliefs and fully understand what drives our perceptions and beliefs. The very process of doing this can result in those perceptions and beliefs changing and opening up new possibilities and opportunities for us in general. Doing this with our collecting can open up enjoyable avenues that before would have gone unconsidered. Most of the values of this issue can be found with at least two shades, with the 3c purple being an outstanding hunting ground for many, many shades of purple that can be found due to difficulties that the CBN experienced with the stability of the colour. The only stamps that seem to show almost no variation are the 2c green and the jet plane stamps. 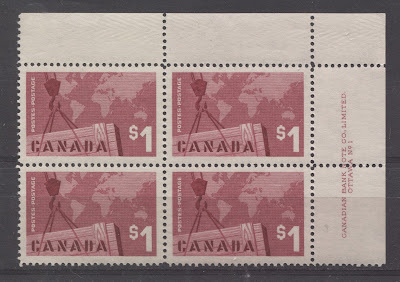 However, I'll bet that with enough searching, it is possible to find some subtle shades of even these stamps. I will try to show some examples of the main shades I have seen in the stamps that I have worked with so far over the years. Of course, there are likely others (many others in the case of the 3c) that are not shown here. But this will hopefully give you some idea of the scope that exists.